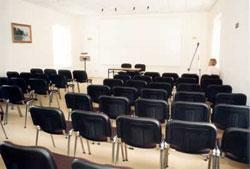 The Conference Room pictured can comfortably accommodate up to 80 persons in a theatre style and has excellent potential for audio visual presentations. The room can also be arranged to suit your specific requirement and is ideal for presentations, meetings, AGM's, product launches, small exhibitions and conferences. Other rooms in the house can also be arranged to provide separate catering facilites or catering can be arranged in the room. External catering facilites can also be arrranged in one of many nearby restaurants by request. Dimensions: 18 Mtrs Length - 10 Mtrs Width Power: Ample Plug Points. Other: Full sound system, OHP and slide projection. Hire Costs: On request.